Ultra-light composite panel with a honeycomb aluminum core and cells of great dimension, bonded to external layers in clear PETG with satin or glossy finishes. 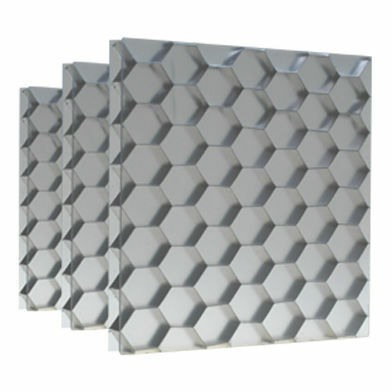 Hexaben Large Plus™ is a composite panel characterized by a strong technological feature thanks to its honeycomb aluminum core borrowed from higher technological applications such as the aerospace ones and for which this honeycomb core was originally designed. Thanks to this higher aesthetical value joined to the light weight, stiffness and transparency, Hexaben Large Plus™ is largely used for indoor architectural, design and furniture applications. Easy to cut Hexaben Large Plus™ panel can be finished with standard accessories profiles and systems such as frames, handles, hinges.